I had the chance to meet and chat with Chef Curtis Stone at the Tanger Outlets Taste and Style event in North Charleston on Saturday and confirmed a few things that I already knew from watching him on TV and reading some of his other cookbooks - he makes cooking easy and fun, he's got a great Australian Accent, he's as nice in person as he seems on his show... and I found out too that he's incredibly generous... he gave me an extra autographed copy of his new book, What's For Dinner? 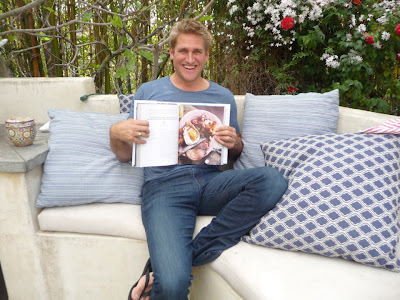 to giveaway to one of you lucky Acting Balanced readers - and an autographed set of funky melamine measuring spoons from his Curtis Stone Kitchen Solutions collection for another reader! Already in the top 10 on Amazon for cookbooks, What's For Dinner has fabulous pictures and easy to follow directions! I am personally putting the Thai Red Curry with Butternut Squash and Chickpeas (Friday), the Oatmeal Coconut Butter Cookies (Something Sweet) and the Grilled Salmon with Orzo, Feta and Red Wine Vinaigrette (Monday) on my meal planning this week! What's For Dinner has everything you want to find in a cookbook - great pictures, easy to understand instructions, extra tips that explain unique ingredients or techniques and there is an attention to detail that makes even the most reluctant cook a success with these recipes! Chef Stone also gave me several coupons to share with readers to save 40% off at his online store - since I don't raffle coupons, I will happily share the coupon code with the first six people who email me at heather@actingbalanced.com and ask me to share it! Since I personally watched Chef Stone sign the giveaway copy and spoons, I can only mail to US or Canadian addresses. Please complete the rafflecopter form below for your chance to win! PS - My friend Heather at I'd Rather Be Changing Diapers was there too and is giving away an autographed copy of the book on her blog too! Disclaimer: This post contains affiliate links. Prizes furnished by Curtis Stone and mailed by Acting Balanced. I attended the Taste and Style event as a US Family Guide Blogger.